The Year of the Red Door has begun, and four months have already passed by. This is the story of the final days of the Second Age. I wanted to explore certain notions of immortality, altered states, and the nature of power. But the story needed to be a rich, immersive epic, character-driven, but within an expansive setting. Authors such as Jane Austen, Victor Hugo, Charles Dickens, Boris Pasternak, and (of course) J.R.R. Tolkien were strong influences. The main protagonist, I decided, needed to be someone relatively sheltered. Educated up to the limits of what was provided in a small town, but ignorant and naive about the world at large. Otherwise, the characters that come and go throughout The Year of the Red Door were defined and developed according to need, plot, and situation. Since it isn't plausible for an epic of this sort to be limited to only a few characters, the population of characters is quite large. "You are troubled, too," she said without turning. Robby stepped up beside her. "Like me, you are lost in change, not knowing what may come of things." "You know what you must do, but not what you should do." "They are the same," she said, turning to him. "When you do what you must, it is as it should be, and leads to the next and the next. This age is coming to an end at last, as all things must, and you are caught between the ending and the beginning of things, born of one but living into another. 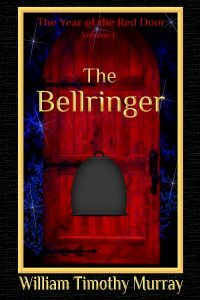 Why should the Bellringer of Tulith Attis be so different? Does fate ignore the unknown person in favor only of kings and queens and the mighty?" "I'm not sure I believe in fate," he said, not meaning to be argumentative but realizing too late that it probably sounded that way. "Fate. Destiny. Chance. Doom. They are but different seasons of the same year," she replied. "Call it what you will. You cannot escape it, no more than you can escape your skin." "Everyone talks to me and about me, but no one will speak plainly," Robby grumbled. "We speak as plainly as we can," Serith Ellyn replied sympathetically. "It is for you to hear or not to hear. Listen first from your heart, then let your head guide you." Robby nodded, but he was not sure that he really understood. "We Elifaen are afraid of change," she explained. "Perhaps we have seen too much of it. All who live long in this world sense the passing away of things. The forest shrinks before the axe and the plough, and meadows are covered with cobblestone and building-brick. White waters of anxious rivers turn dark and slow and wind more peacefully to the sea. Even the sun seems not so high or so bright as in the days of our youth, and the snow not so fresh or clean, only colder. We attach ourselves to these things, as they to us, and, even as our attachments grow more tenuous with each passing year, we cling the harder to them. Yet so, too, are the works of our hands, as the earth strives to take back what is hers. Proud houses fall into decline and great cities pass into ruin. The stories of those things are lost to forgotten languages and moth-eaten scrolls. Vine and root grapple with the rune carved in stone, and rust carries away, fleck by fleck, the great gates of iron."